You may not be sure what kind of toys, or how many, you baby should have. It’s likely that you hear conflicting advice that runs from one extreme to another! It’s either: “Don’t give your baby toys - he’ll be spoiled,” to “Give your baby lots of toys - they develop his brain.” So…which is it? Both sides of this debate have valid points. A baby does indeed learn from the things she plays with, and the more things she has access to, the more she can learn. With this in mind, many parents spend a fortune buying toys; however, many toys hold a child’s attention for three or four days, only to be relegated to the bottom of the toybox or back of a shelf. 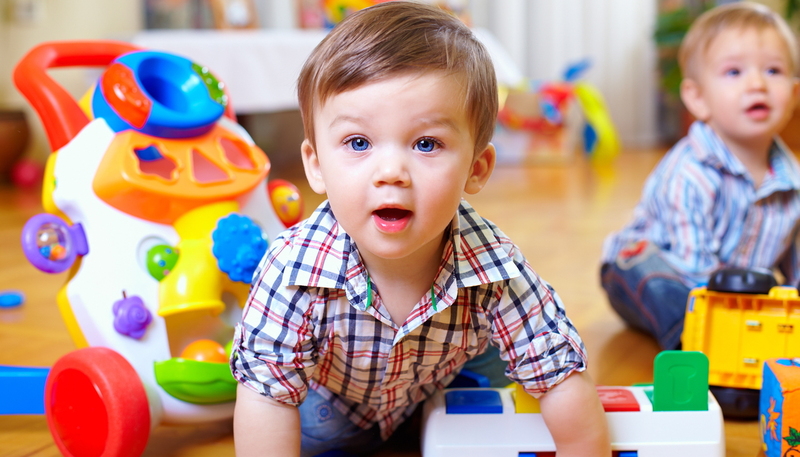 Experts agree that babies need a variety of toys to enrich their lives and encourage learning. While your baby can learn from expensive store-bought toys, she can also learn from a crumpled piece of paper, a set of measuring spoons, an empty box, or a leaf. Everything is new and interesting to a baby, and if you open your eyes to the many wonders in our world, you’ll see that you don’t have to spend a fortune to keep your baby happy, interested, and learning. What “Home-Grown” Toys Are Best? Babies are generalists. Your little one will apply what he learns from one object to any other that is similar. Therefore, don’t give him an old book or magazine to scribble in unless you want all of your books to be potential notepads. A sealed bottle may look fun, but your baby may then think he can play with your pill bottles. Take a closer look at the things you consider “trash.” Some may be valuable toys! Empty boxes, egg cartons, and tin containers are just a few examples of everyday castoffs that, once cleaned, can provide endless hours of play. Your kitchen is overflowing with baby toys! Once your little one begins to crawl, it’s time to rearrange the kitchen. Put all your baby-safe items, such as plastic containers, pots and pans, potholders and canned goods, in your lower cabinets and let your baby know where his “toys” are. You’ll have to relax your housekeeping standards and deal with disorganized cabinets for a while, but the play potential is so fantastic that it’s worth it! Young children love water play, and a bowl or pan of water along with spoons and cups of various sizes make a fabulous source of fun. You can put your baby in his high chair, sit him on the floor on a beach towel, or take him outside in a shady spot if the weather’s warm. I guarantee he’ll be soaked when he’s done, but that will be after a very long and happy play session. Containers to fill and empty are lots of fun for a baby. You can safely fulfill your older baby’s desire to manipulate small things by filling a large bowl with a variety of colorful children’s cereals (nothing hard or ball-shaped) and supplying spoons, measuring cups, and other containers. Since you’re using cereal pieces, it’s okay if some end up in his mouth. Don’t try this with beads, seeds, macaroni, or other items that pose a choking hazard. A while ago, I went to the toy store to buy my youngest child, Coleton, a toy that my older three adored when they were babies. It was a simple pop-up toy for toddlers with various buttons, levers, and dials. I found a bewildering variety of this kind of toy, but to my dismay, every single one was electronic. They made sounds, they made music, they had blinking lights - they just about played by themselves! I finally had to order the prized toy from a specialty catalog that carries “back to basics” toys. 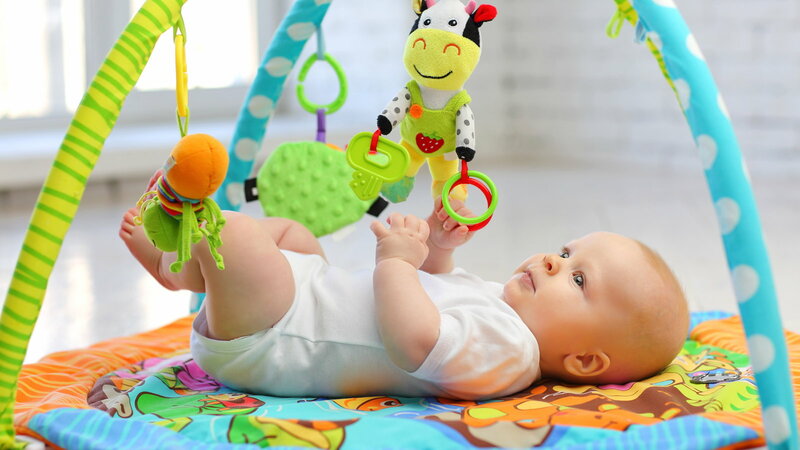 Sure, electronic toys can be exciting - for a while - but they can also stunt your baby’s developing ability to imagine and manipulate (and let’s face it: those repetitive electronic sounds can get annoying). If a toy does everything by itself, it loses its potential as a tool for developing creativity. Also, if your little one gets used to these toys, then simple pleasures like wooden blocks seem boring by comparison because he expects the blocks to play for him. And those simple toys are among the very best for baby playtime. Long-term play value: Will this hold your little one’s attention for more than a few weeks? Solid simplicity: Babies don’t need complicated toys. Appropriateness. Does it match your baby’s thinking, language, and motor skills? Fit with your family value system: Does this toy reflect your family’s particular values? For example, is the toy friendly to the environment? Does it promote diversity? Are you comfortable with what the toy represents? Novelty: Is this toy different from others your baby already has? You don’t want a toy box filled with 30 different kinds of rattles! Board books; Foot or hand puppets; Musical toys; Rattles; Small, lightweight, easy-to-grasp toys; Squeaky toys; Teething rings; Toys with high-contrast graphics, bright colors, or black-and-white patterns. Activity boxes (levers/buttons/dials/hinges); Balls; Beginning puzzles (two or three large pieces; knobs are helpful); Blocks Cars and trucks; Chunky small people and accessories; Dolls and stuffed animals; Hammering toys; Large interlocking beads; Modeling dough; Musical toys; Nesting cups; Peg boards; Picture books; Plastic animals; Pop-up toys; Push or pull toys; Shape sorters; Stacking rings; Toy versions of everyday items (telephones, cooking utensils, doctor kits); Toys you still remember from your childhood (The classics endure and are always a good bet! ); Washable crayons or markers and blank paper. As you give you baby new things to play with, keep in mind that there is no right way to play with toys. For example, a puzzle is not always for “puzzling.” The pieces make great manipulative characters, can be sorted or put in boxes, and make interesting noises when banged together or against an empty pot. Children learn through play, so any toy they enjoy playing with is, by definition, educational. Discard any plastic wrapping, plastic bags, packaging, or tags before giving a toy to a baby. Always watch for choking hazards. Anything small enough to fit in your baby’s mouth has the potential for danger. Watch for pieces that may become loose from a larger object, too. Make sure that no small parts can be pulled off or chewed off the toy. Always abide by the age rating on the package. No matter how smart your child is or how wonderful the toy, don't second-guess the manufacturer, since age rankings often are given due to safety issues. 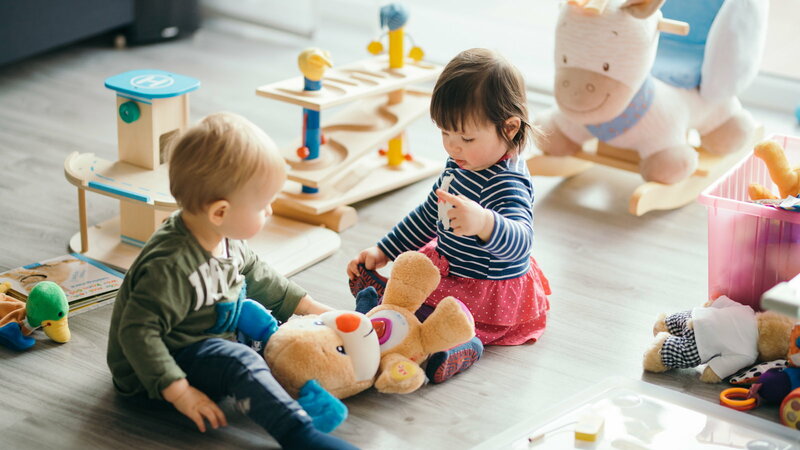 If you choose to purchase a toy with an older age recommendation, make certain that the toy is used only when you are playing with your baby, and that it is stored where your baby can’t get to it without your supervision. Avoid pull toys with long cords that could wind around your baby’s neck. Pull toys for babies should have either very short strings or rigid handles. Beware of excessively loud toys. Babies tend to hold things close to their faces, and you want to protect your baby’s sensitive ears. Your baby’s toybox should have a special safety lid (or no lid at all) to prevent it from slamming on your baby's head or hands, or trapping your baby inside. There shouldn’t be any hinges that could pinch little fingers. If a toy is second-hand (whether purchased from a second-hand store or garage sale, or given to you by a friend or relative), give all of the above rules extra consideration. If you have any doubts, always err on the side of safety and discard the toy. Don’t let your baby play with a paint-finished toy that appears to be older than a few years - the paint may be lead-based, which poses serious hazards to a baby who touches or mouths it.